Later this month, Nets minority owner Jay-Z will help open the brand new Barclays Center arena in Brooklyn with a series of concerts at the venue. Later this month, Nets minority owner Jay-Z will help open the brand new Barclays Center arena in Brooklyn with a series of concerts at the venue. If you haven't been able to secure tickets for one of these highly anticipated shows, NYC-based retailer Kith is giving away a pair, with a few sweeteners thrown in to boot. Entering the Kith NYC Jay-Z Ticket Giveaway is simple: follow @Kithset & @RonnieFieg on Twitter, @KithNYC & @RonnieFieg on Instagram and 'like' KithNYC on Facebook. 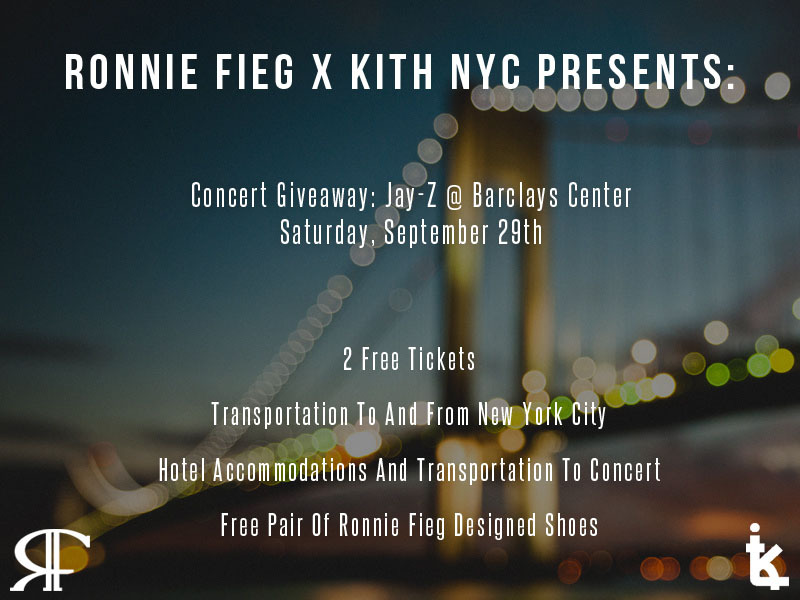 One winner will receive two tickets to the September 29 show; transportation to and from New York City; hotel accommodations and transportation to the concert; and a pair of Ronnie Fieg designer shoes. Visit KithNYC for more information.